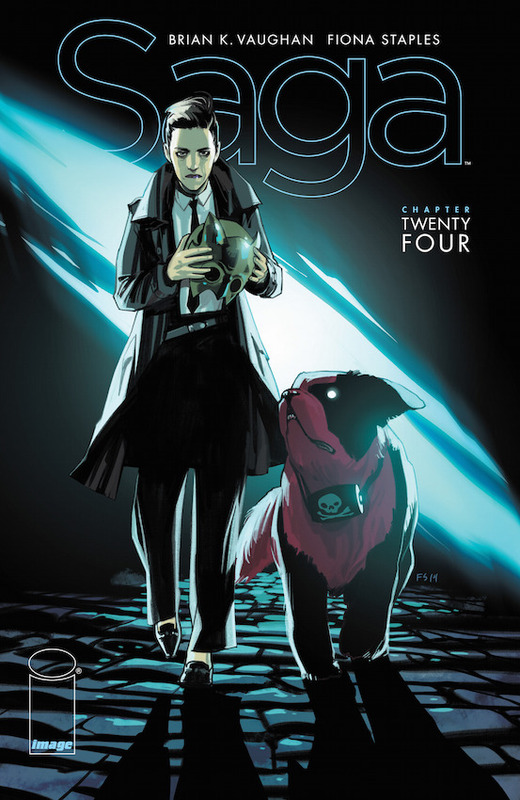 It has been such a long time that Saga was chosen as a cover of the week which is odd considering how incredible Fiona Staples composes her pages. She has an innate ability to construct a page that is wonderfully coherent and everything has its place. With the banners and logos that cluster pages in DC and Marvel books, it is amazing how labile the Image icon and book title are. Here we barely notice them and the perfect ensemble of light and aquamarine blue only aid in the lighting affects of the page. The cobbled streets are pitch black except for the brightly coloured light shining from behind our characters. They cast long shadows towards us as they move away from the light. The Brand and Sweet Boy make a delightfully villainous combination. The freelancer has classic detective garb with the long trench coat, shirt and tie whilst carrying quite the ominous laden headwear. I like his shoes, a loaf variety with metal links. Sweet Boy looks anything but with the most incredible red colouring, which shines from the page as it provides perfect contrast from the blues of the page. His white eyes and classic St.Bernard neck barrel depicting a skull and crossbones is certainly a warning to heed. Not containing medicine, tobacco or alcohol we can only assume it is poison, especially since they are assassins. His head tilts upwards and towards The Brand is a subtle point towards obedience and a request for direction or approval. As beautiful as the colours are on this page, there is an air of shadiness as these two antagonists make their way through dimly lighted back streets. Who knows to where? Next PostThe Theatre List 29/10 – Wait! What do you mean no Marvel?